and makes known the preciousness of Christ in every place. Once each week I work a few hours at a local Christian agency. My grand and glorious job title is best described as Go-fer, as in “go fer” whatever my overworked and underappreciated boss has piled up on his desk. Sometimes it’s as dramatic as shredding old copies or discarding outdated files. Always it’s making a fresh pot of coffee. And then there are the days when I line up mailing envelopes on the work table, attach a proper mailing label to each and begin filling them with travel instructions, flight plans, insurance papers and other necessary documents for people going to countries around the world. Some of these destinations are “friendly,” others more “secure,” but in every place trip participants will assist educators in better preparing their young people to be responsible citizens. While presenting these sound teaching and administration principles, the teams are always ready and well equipped to sensitively present the claims of Christ. While I don’t have access to personnel files, I asked my boss to guess the average age of these people whose suitcases show the wear and tear of frequent travel. His answer didn’t surprise me in the least: early to mid-sixties. These people have, in the mind of our Western culture, earned the right to retire and relax (“unwind, rest, slow down, lighten up, settle down, unwind”—all thesaurus synonyms for relax!). Most of these people once earned their incomes in secular fields and now joyfully, willingly labor in another Kingdom locale though not one advertised in Seniors’ River Cruises© or Sun City© brochures! A friend, now retired from his career as a university professor, describes this period of his life as “re-treading.” Retread—a re-manufacturing process for tires that replace the tread on worn tires. Retreading is applied to casings of spent tires that have been inspected and repaired. How true of the people represented by the mailing labels. Many are “worn and spent” from long careers, but the Holy Spirit is inspecting and repairing in preparation for the next phase of the journey. Christians in the New Testament were forced by persecution to “retire” from their homes, families and businesses in Jerusalem and environs. They scattered to places as distant as the Black Sea to the north, Mediterranean Sea to the south, Aegean sea to the west. “Those who were scattered went about preaching the word…” No visas or passports. No emergency evacuation procedures. Scars their only souvenirs. What if every “retired” Western Christian obeyed the same call? Packed the same bag whether traveling to a neighbor across the street or reaching out to teachers across the globe? Waking every morning with the clarion call of God emblazoned on their personal horizons? “Where do you want me to go today, Lord? Who do you want be to love?” It’s not just for the favored few, for the theologically schooled, for the economically privileged. It’s for all who have chosen to follow the Savior. Your name—my name—can be on mailing labels! *For more information on these projects, please contact me at mj.ehle@comcast.net. Bonnie and her husband are well known in this community for their works of philanthropy. Words of condolence on a website were filled with a review of their generous gifts, their love of and work to preserve our beautiful Colorado environment, their encouragement to young and old. But it is Bonnie’s unswerving trust in God, her unwavering commitment to spend time daily drinking deep from God’s Word, her acceptance of God’s will—“Because he loves us!”—that is known now and will be remembered for eternity. But how does “it is what it is” even remotely connect to how we live out the Christ life? What biblical models do we find? Jesus, faced with 4,000 hungry people, simply turned to his disciples and said, “You feed them.” When he needs Peter’s boat as a pulpit because the crowds are growing, he just gets in, rows a bit off shore and preaches. It is what it is. When a prominent and wealthy young man decided the cost of following Jesus was too high, Jesus accepted his words but didn’t beg him to reconsider. It is what it is. Evangelical scholar John R. W. Stott’s profound influence on pastors, students and laypeople around the world is beyond measure. In a 2011 tribute to Stott who had died at age 90 just a few days before, journalist Wolfgang Saxon wrote in The New York Times, For him, Christianity means probing the mysteries of Christ. He is always exploring paradoxes… For all his fame on several continents, Mr. Stott’s travels and appearances were remarkably devoid of pomp, befitting his simple message of reason and faith and his unassuming demeanor… In his later years, he lived in a two-room apartment over the garage of a London rectory, and for many years he kept a small cottage on the Welsh coast, where he did much of his prodigious writing in longhand and, until 2001, without electricity. Many years ago, an acquaintance attempted to deepen what he presumed was my obviously weak and shallow reading interests. 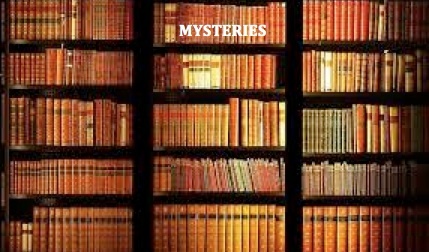 He somewhat smugly announced that the only reading he allowed himself was “Christian.” I figuratively slumped because I’d just glowingly described my enjoyment of a work of fiction…a mystery novel, no less. Some time after this I heard about John Stott’s reading habits. Reading habits of the renowned, intellectually unsurpassed, holy Reverend John R. W. Stott! I learned that he loved the mysteries of Agatha Christie, someone I cut my reading teeth on while still a teenager. Could it have been in that small Welsh cottage where he turned the pages of Miss Marple’s or Hercule Poirot’s adventures? So what’s the connection between all this and mysteries of the faith? I grew up in a church where the word “mystery”—as connected to the Christian faith—was mostly unheard and suspect when whispered. I learned the certainty of scripture. Words like “know” and “truth” were essential to that certainty. “Know the truth…” “The Spirit will lead you…into all truth.” “If you abide in my word, you are truly my disciples, and you will know the truth, and the truth will set you free.” While I deeply and fervently believe all that, I also believe that in our quest to be “sure” of what we believe, we far too quickly skim over parts of the Bible, topics like unanswered prayer, even essential tenets of our faith, because to not have an answer, to submit to the mystery of God, is uncomfortable. In a well-written mystery, there are many moments of discomfort: who did this? why? what will be the outcome? In some stories, many of those questions will be answered, although often only when the last page has been turned. Except for that pesky “why” question. Often it lingers in my reader mind long after the book has been returned to the shelf. Sociologist Robert Withnow writes, …Christianity…leaves people with a set of questions they cannot escape… (Living the question) means pursuing the intellectual life because the questions are inherently important, not because one hopes primarily to advance a career or even because one necessarily expects to discover a definitive answer. One of my favorite authors who wrestles with the question of doubt, or at least “not knowing everything all the time,” is Philip Yancey. In answer to the question Why don’t more Christians discuss doubt (and maybe ‘mystery’??) honestly and openly? Yancey responds, Christians tend to be propagandists. We want to convince others, put on a good face, inspire. And we also tend to ignore the Old Testament, which is where many of the questions (and questioners) are. The Old Testament proves that God honors questioners. Remember, grumpy Job emerges as the hero of that book, not his theologically defensive friends. In another interview, Yancey says, …at the end of Job, where God (gives) that magnificent speech where he basically says: “Job, you have no idea… My job is to run the universe and I’m doing that quite well.” He then turns to Job and says, “That’s not your job, you couldn’t understand it, there’s no way you could understand it; your job is to believe me and trust me.” I suspect that John Stott, for whom all mysteries are now solved, would heartily agree with Yancey and Withnow. And he applauds when I read Christie, Stout, Sayers and P.D. James. 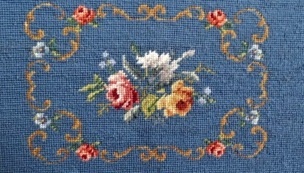 Amid bone china teacups and other mementos of a life graciously lived, we found a crumpled piece of completed needlepoint. Blue background still brilliant, red flowers still glowing, each stitch still precise, yet there it lay, unused and forgotten, unclaimed. I guessed its original purpose was either as a chair seat cover or to upholster a footstool commonly used in the late 19th- early 20th-century. When queried about its origin and designer, my mother-in-law somewhat nonchalantly commented, “Oh, my mother made that when she was pregnant with me.” This still beautiful piece of stitchery was over 100 years old! When immediate family members insisted they didn’t want the item, I happily made my claim. Later I entrusted it to a professional who skillfully stretched and framed it, and since that day, displayed on our living room wall, it has been admired and its creator remembered. It has been reclaimed and repurposed. On this day after Easter, I can think of no greater description of God’s work in Christ on the cross: the Savior made the ultimate, costly sacrifice to reclaim and repurpose all that had been damaged, lost, even forgotten in the Garden. Found only in the Gospel of John, Jesus’ “It is finished” cry on the cross—the Greek word translated tetelestai—is an accounting term that means “paid in full.” One scholar adds, “The perfect tense (of the word) indicates that the progress of the action has been completed and the result of that action is ongoing and with full effect.” In other words, Jesus has redeemed us, is committed to current action of forming us into the image of Christ, and will one day present us to the Father, full and complete. It’s that current action—shall we call it the “stretching, framing” action?—that frequently makes us edgy and impatient. We inevitably walk through the floods and fires of life, forgetting it’s exactly in the process of walking—hand in hand with Christ and with our eyes firmly fixed on God’s purposes—which will produce a beautiful finished product fit for the Father’s glory. Why is it so easy to misinterpret and resist the process? God gave the Old Testament prophet, Jeremiah, a vivid lesson. He sent him to the house of a potter to watch the craftsman working at his wheel. From the New English Translation of the Bible we read Jeremiah’s description of what he saw: Now and then there would be something wrong with the pot (the potter) was molding from the clay with his hands. So he would rework the clay into another pot as he saw fit. Two pieces of art: needlepoint and a clay pot. Both reclaimed and repurposed for God’s glory.